My friend Carl emailed me this yesterday, which I asked permission to republish. I was taken aback by yesterday’s headlines. After all, I just discovered Hungarian sausage, which is even better than German Summer Sausage (I know, I couldn’t believe it, either, but it IS! Garlicky goodness mixed with a smoky final note flavor — put that on dark rye with some sharp white Vermont cheddar and that could be my last meal on death row!). Google “bacon” and here’s what comes up today. Unless you’ve been under a rock today, you’ve heard, seen or read that the world is coming apart at the seams. 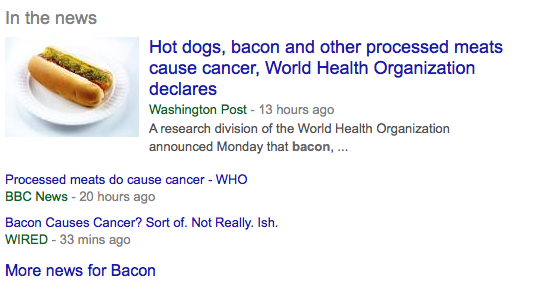 “Meat causes cancer!” is all over the news. Quick, hide the women and children. Break out the broccoli. Toss out the Weber. Run for your lives…! Ummmm. Wait a minute. How about the data? Got any? I dug into the numbers beyond the headlines. What really bothered me was that almost no one was reporting facts; just hype and innuendo. 2,400% vs 1% yet they compare steak to cigarettes. Is this good public policy? This is using THEIR DATA. Also, they did ZERO studies of their own. They compiled data from 800 previously existing epidemiological studies. Collating these wildly disparate studies, even with IBM Watson, is a huge undertaking. Even if done without bias (unlikely), many of the 800 studies are, by themselves, “quasi-science,” which is the nature of epidemiological studies. Lots of headlines for not a lot of fact. Again I ask: Is this good public policy? One more thing. Their findings on RED MEAT (beef, pork, and lamb) were COMPLETELY INCONCLUSIVE, but they lumped it in with processed meat for good measure. Guilt by association with no definitive link. No data to definitively support a link to fresh red meat but somehow it’s the new tobacco. No one is suggesting you live on Slim-jims or bratwursts, but pulling the fire alarm on all red meats smacks of an agenda. Can you say “Bad Science”?